Cytoreductive surgery (CRS) followed by platinum-based chemotherapy is the cornerstone of treatment for advanced epithelial ovarian cancer (EOC). While elderly patients are generally at an increased risk for perioperative morbidity, many studies demonstrate that the elderly are just as likely to benefit from aggressive standard of care treatment as are younger patients. Despite this, elderly patients with cancer are more likely to undergo substandard surgical management, resulting in poorer disease-specific and overall survival. In order to optimize the benefit of CRS while minimizing the risks of perioperative complications, patients must be carefully selected and prepared for surgery. 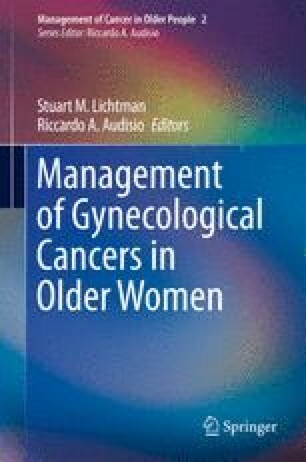 The following chapter presents the current evidence regarding CRS in older patients and reviews important aspects of patient selection, preoperative preparation, intraoperative techniques, postoperative care, and management of complications in older patients with EOC. Ries LAG, Harkins D, Krapcho M, Mariotto A, Miller BA, Feuer EJ, Clegg L, Eisner MP, Horner MJ, Howlader N, Hayat M, Hankey BF, Edwards BK (eds). SEER Cancer Statistics Review, 1975–2003, National Cancer Institute. Bethesda, MD, http://seer.cancer.gov/csr/1975_2003 based on November 2005 SEER data submission, posted to the SEER web site, 2006.